Great for smoothies, jams, jellies, pies or just eating fresh. They are washed and Individually Quick Froze. No sugar or water added. In large bowl, gently toss raspberries and cherries. Add 1 1/2 cups sugar, the tapioca and lemon juice. Mix well; let stand 1 hour. Heat oven to 400°F. Place 1 pie crust in ungreased 9-inch glass pie plate. Spoon fruit mixture into pastry-lined pie plate; dot with butter. Cut remaining crust into 1-inch strips. To make top crust, place 5 to 7 strips pie crust across filling. Place cross-strips over tops of first strips. Crimp edges. Brush crust with milk; sprinkle with 1 teaspoon sugar. Cover edge of crust with 2- to 3-inch wide strips of foil to prevent excessive browning. Bake 15 minutes. Reduce heat to 350°F; bake 40 to 45 minutes, removing foil after 10 minutes, until filling is bubbly and crust is golden brown. Cool completely on cooling rack, about 2 hours. Red Raspberries contain strong antioxidants such as Vitamin C, quercetin and gallic acid that fight against cancer, heart and circulatory disease and age-related decline. They are high in ellagic acid, a known chemopreventative, and have been shown to have anti-inflammatory properties. Red raspberry ketones are currently being used in Japan as a weight loss supplement. Red raspberry seed oil is creating market interest in the cosmeceutical industry because it is rich in Vitamin E, omega-3 fatty acid and has a sun protection factor (SPF) of 24-50. High in polyphenolic compounds known for their anti-cancer properties. Contain strong antioxidants such as Vitamin C, quercetin and gallic acid. Have a high ORAC level – ORAC is a measure of the antioxidant capacity of a substance. Red raspberries with an ORAC of 24 µmole/TE/g are similar to blueberries, well known for their antioxidant values. Raspberries have been shown to inhibit the production of COX-I and COX-II enzymes. Anti inflammatory products like ibuprofen and aspirin, inhibit COX-I and COX-II resulting in the reduction of pain associated with arthritis, gout and other inflammatory conditions. Eating whole berries has been shown in scientific studies to be more beneficial than taking the individual phytochemicals in the form of dietary supplements. Red raspberry oil is creating interest in the cosmeceutical market (skin care products which provide health benefits). The oil from raspberry seeds is rich in Vitamin E, Omega-3 fatty acids and has a sun protection factor (SPF) of 25-50. Red raspberry ketones are currently being used in Japan as a weight loss supplement in a pill form and as an external patch. Each 5 Lb. bag of Red Raspberries is packed in it's own Styrofoam cooler with a large gel ice pack and then placed in a cardboard box for shipping. 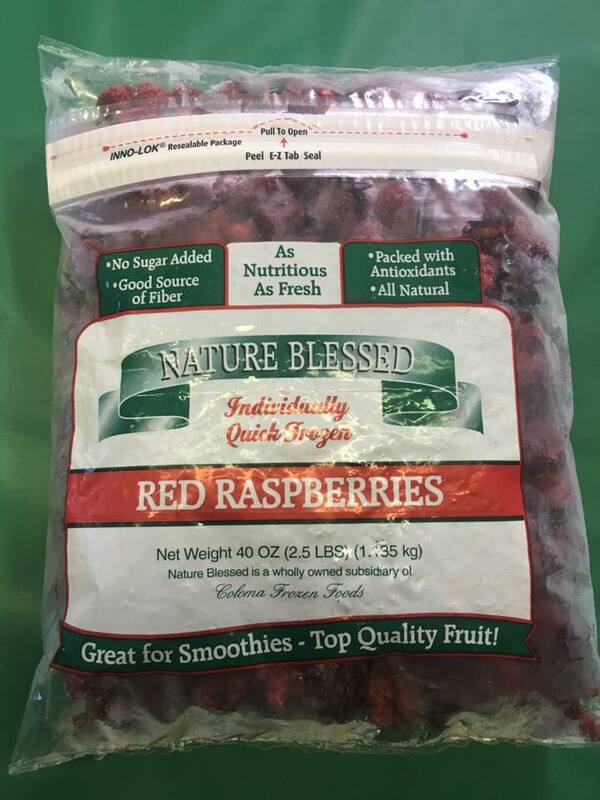 When ordering keep in mind that if you want the red raspberries to arrive frozen you need to choose an overnight or 1 day option. If you choose another shipping option the red raspberries will thaw some, but can be re-froze when you receive them. We ship every Monday and Wednesday of each week all year long. Keep in mind when ordering that there is always less thawing in the fall & winter months than in the summer months. Copyright Frank Farms. All Rights Reserved. eCommerce Hosting by 3DCart.